�	Brushless Ac Induction Motor, Absolutely Maintenance Free With Frequency Inverter. �	Hollow Shaft Giving Facility Of Shaft Length Adjustment. �	Stirring Shaft Ss 316, Retort Rods Ss 304. Designed To Meet The Needs Of Homogenization, Emulsification, Dispersion & Mixing Of Variable Viscosity Fluids In Pharmaceutical Industries And Laboratories. Propeller Housed In Flanged Type Cage Supplied In Standard Unit. Optional Saw-cutter Impeller Helps In Further Reducing The Particle Sizes. Built In Digital Rpm Indicator Valuable For Process Validation And Reproducibility. �	Brushless Ac Induction Motor With Frequency Inverter Giving High Torque Even At Low Speeds. �	Facility For Pre-setting Of Stirring Speed In Increments Of 10 Rpm. �	Stable And Constant Speed, Irrespective Of Change In Voltage Or Load. 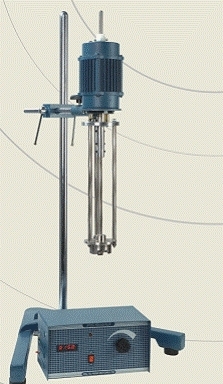 �	Stirring Shaft Ss 316. Retort Rods Ss 304.